Nurseries and kids bedrooms are such fun spaces to decorate. You can incorporate whimsical details and themes. Through the years we have worked on precious nurseries and vibrant kid spaces. Here’s a tour of some of our favorite kid spaces with tips on how you can create memorable kid spaces in your home. This nursery for twin boys has such fun, modern details. It doesn’t have an obvious theme, but that’s what makes it even more precious. 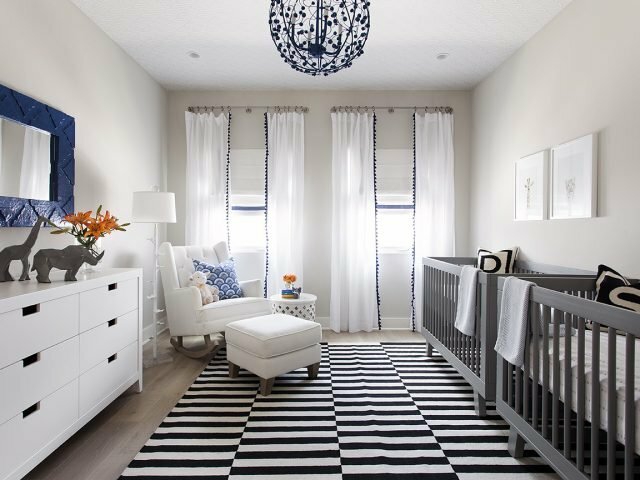 Framed baby animal prints, a graphic rug, draperies with a navy blue tassel detail, and navy chandelier make the space a darling space for babies. The details can also transition as the twins grow up. This nursery is sophisticated and sweet. Classic framed prints and fabrics make the space a darling space that is chic enough to withstand the test of time. Design Tip: Try to select pieces that can be used beyond a nursery or kids space. Look for durable and stylish pieces that can transition with your child. For this space, the chest, lighting, and fabrics are classic, but have some whimsical detailing that stills feel young and youthful. This travel themed nursery has a lot of texture and style. Navy grasscloth wallpaper gives the crib wall depth and drama. 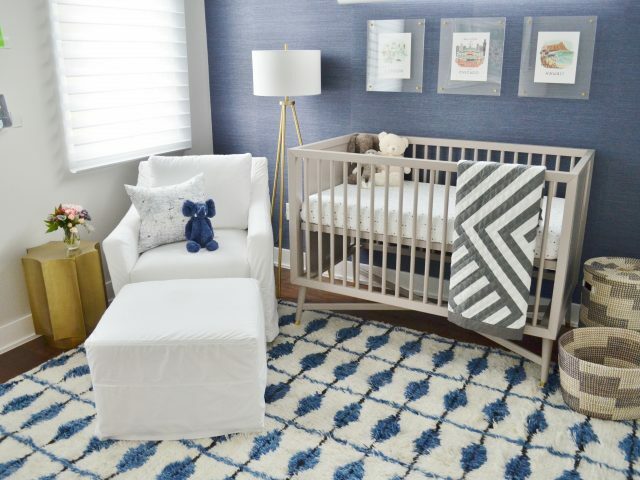 Woven baskets provide extra storage and a plush rug with a graphic print makes the nursery modern and cozy. Our designer, Raquel, transformed her baby’s nursery with fun details and wall full of storage for baskets and display pieces. 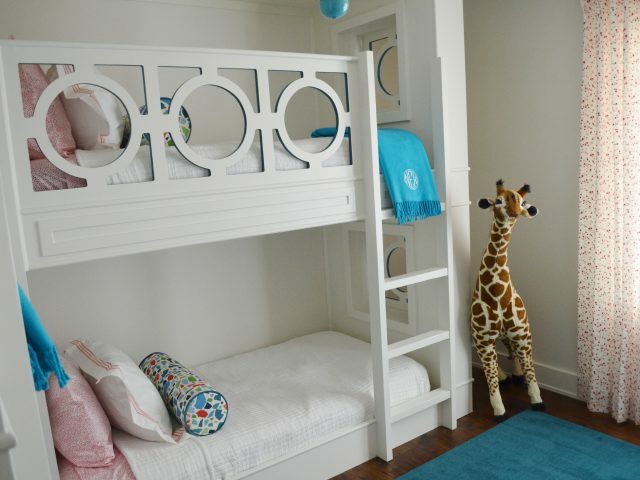 Designer Tip: Storage is essential in a nursery and kids space. 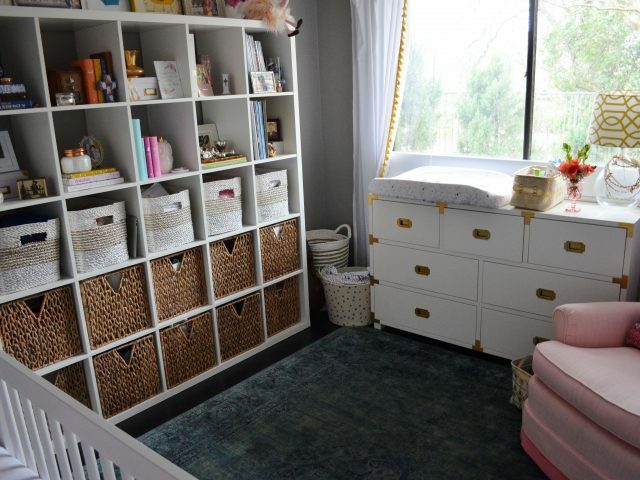 A large built-in with baskets can hide-away all baby essentials. Baskets are a great way to to keep you organized. 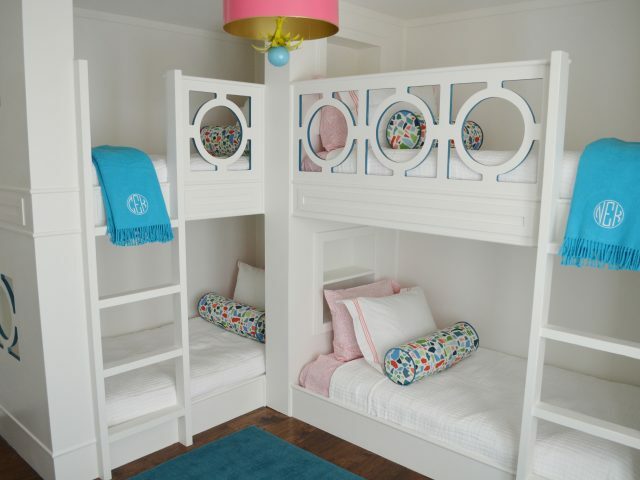 In this project, we installed custom-built bunk beds with a fun pattern cut-out. What a fun space for sleepovers! Now the sisters that share the bedroom have a unique space to sleep and play. 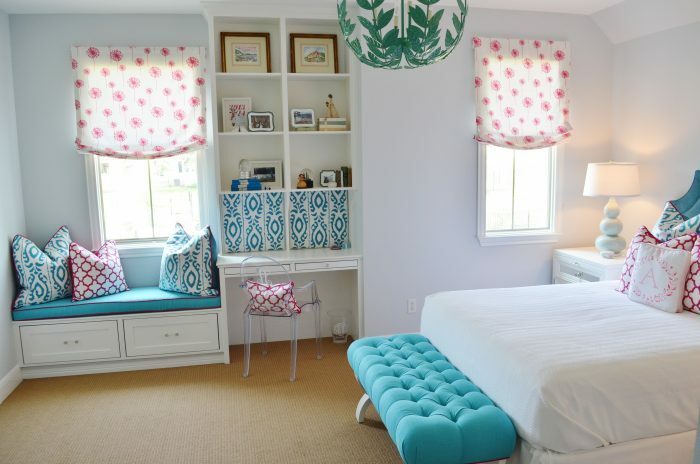 Colorful pillows and draperies make this space even more bright and fun! Design Tip: This was a small space and bunk beds were the most practical solution for a shared bedroom. There are many ready-made options, but if you want something a little more special, you can create such a unique space with custom designed beds like these. You can really dress up a kid’s bedroom with fun lighting. 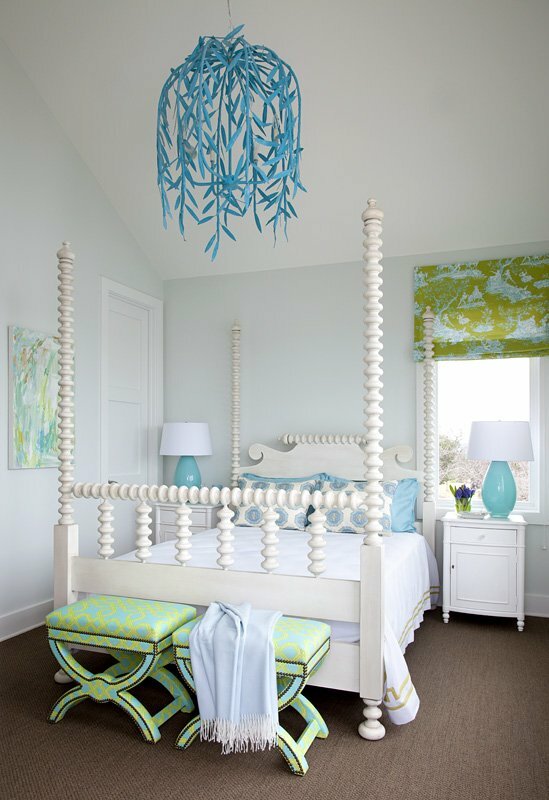 This bright turquoise chandelier is so playful and bright. It makes the room! Another set of twins shared a spacious bedroom and thankfully the same interests. They wanted a feminine and girly space that showcased their love for ballet. Pretty blush gingham pillows paired with a fun floral patterned pillow softens the pair of beds. A pair of tufted grey benches also adds some glamour to the girly ballerina room. A gallery wall with ballet slippers and frilly frames finish out the soft pink room with ballerina details. This room has such a vibrant mix of colors: hot pink and turquoise. A custom window seat and built-in desk give the young tween her own space. As the school year winds down and with summer a few short months away, it is the perfect time to consider a kids room makeover. If you are interested in our services, the space would be ready right before the next school year starts. Get your appointment booked and learn more about our services by following this link and filling out our questionnaire.